​What is an ion foot detox? An ionic foot detox is a type of foot bath that is charged with regulated electrical currents in an effort to quickly rid the body of toxins. 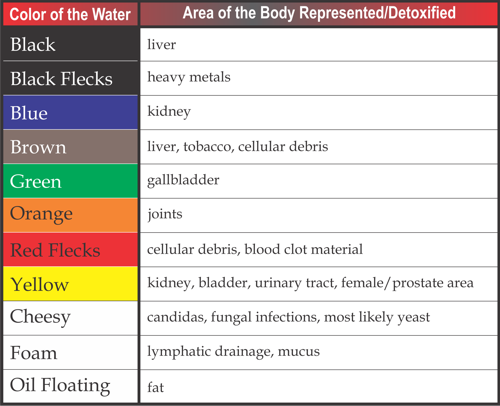 The charges in the water draw out toxins from your body, more specifically your feet as they are placed in the water. During a session the client sits in a comfortable chair. Surrounded by soft relaxing music and aromatherapy. Most individuals find the experience very relaxing and it is not unusual for the client to fall asleep. The session takes about 30–40 minutes. Some people may experience a slight tickling or tingling sensation from the ionic detox foot bath. This will depend on your personal condition, lifestyle, and your willingness to take responsibility for your own health. The frequency of the detox foot bath sessions will also play a role in how quickly results are achieved.